Recently acquired by Tidewater Scale Butcher Supply of Norfolk, the team approached VISIONEFX to create an updated web design presence that would help them capture the online interest of plumbers, electricians, cabin makers and construction companies. They asked for a bold, mobile friendly search for Google site design for improved ranking on Google. VISIONEFX used bold background imagery and powerful images in a ‘focus box’ setting on the homepage. These icon theme elements carry through to all the interior pages. Every interior page has a highly-visual call-to-action area, rich content and photos. The home page also features scrolling OEM logos for the brands they carry or service. 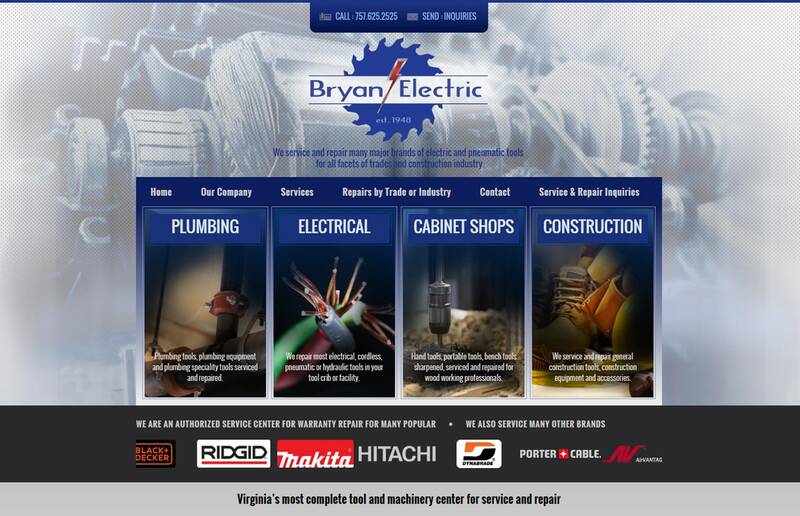 Since 1948 Bryan Electric repairs electrical, cordless, pneumatic or hydraulic tools and has a brick and mortar store and service facility location downtown Norfolk, Virginia. When searching Website Designers Norfolk VA look no further than VISIONEFX for all of your website needs.